GUNTECH USA AR15 ALUMINUM .750 RAIL HEIGHT GAS BLOCK CLAMP ON STYLE. DOUBLE SIDED RAILS ON TOP AND BOTTOM. COMES WITH ALLEN WRENCH AND POLL PIN. WILL WORK WITH BOTH AR15 AND AR308 PLATFORMS. GUNTECH USA AR15 ALUMINUM .750 GAS BLOCK HEIGHT RAILED GAS BLOCK CLAMP ON STYLE. RAIL ON TOP IS LOWER THAN YOUR UPPER BY A TOUCH. SO IF YOUR PUTTING IRON SIGHT ON MAKE SURE TO GET THE FRONT SIGHT A LITTLE TALLER. COMES WITH ALLEN WRENCH AND POLL PIN. WILL WORK WITH BOTH AR15 AND AR308 PLATFORMS. AR-15 made in the USA low profile gas block. This gas block replaces your existing front sight to provide a simple, low profile design that can be used to mount a free float rail over the top, etc. Gas block Is mounted by the use of two set screws and is .950 Inches long. Manufactured from high quality steel with a Melonite finish. Set screw design for .625" barrels. AR-15 made in the USA low profile gas block. This gas block replaces your existing front sight to provide a simple, low profile design that can be used to mount a free float rail over the top, etc. Gas block Is mounted by the use of two set screws and is .950 Inches long. Manufactured from high quality steel with a Melonite finish. Set screw design for .750" barrels. AR-15 made in the USA low profile gas block. This gas block replaces your existing front sight to provide a simple, low profile design that can be used to mount a free float rail over the top, etc. Gas block Is mounted by the use of two set screws and is .950 Inches long. Manufactured from high quality steel with a Melonite finish. Set screw design for .875" barrels. This gas block replaces your existing front sight to provide a simple, low profile design that can be used to mount a free float rail over the top, etc. Gas block Is mounted by the use of two set screws and is .950 Inches long. Manufactured from high quality steel with a Melonite finish. Set screw design for .936" barrels. 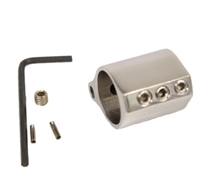 AR15/AR308 Guntech USA "Stainless Steel" low profile gas block. This gas block is a set set screw style and is designed for .750" barrels. This gas block will work for both AR15/AR308 platforms. Made in the USA!! The Odin Works .750 low profile gas block is manufactured to ensure proper function of the gas-system and engineered to fit inside all Odin Works free float for-ends. This Odin Works product is protected by the Odin Lifetime Warranty! 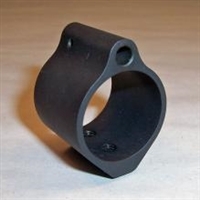 This gas block will work for both AR15/AR308 platforms. Made in the USA!! Yankee Hill Machine low profile gas block. This gas block is a set set screw style and is designed for .750" barrels. 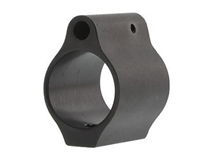 This gas block will work for both AR15/AR308 platforms. Made in the USA! !